It’s National Girl Scout cookie weekend and Girl Scout cookies are here! The troops of Alpena are out on location selling your favorite flavor for a great cause. 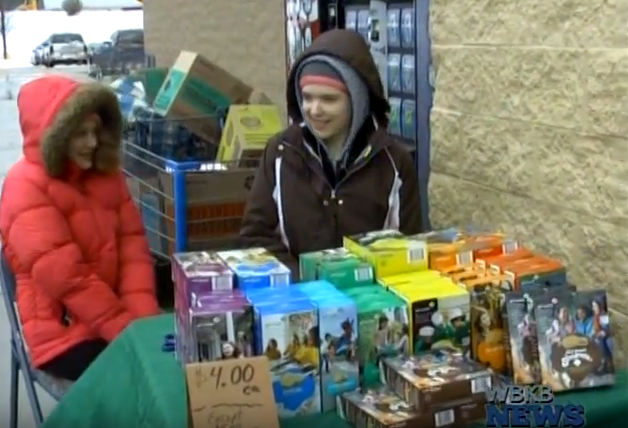 Up 10% this year, over 1,300 cases of scout cookies were unloaded in Alpena. Scout troops were out on location selling a variety of cookies Friday to help raise funds for future events, projects and more. Product sales director, Cindy Ranshaw said the fundraiser teaches troops responsibility. “It also teaches them responsibility, it teaches them how to use money, how to make change, how to deal with customers, how to deal with marketing. There are a lot of educational programs and badges that are related to the cookie sales. It’s never been just the money. It’s always been the processing of teaching them to deal with people, to make the change to be marketable to be out there and be positive,” Ranshaw said. Ranshaw said the support from the community over the years has been nothing but positive and great. “This community has always supported girl scouts and boy scouts. It’s a great deal up here in the north and it’s apart of our life. So they’re (community) always out there, and up to anything that we’re doing, not just cookies and candies but anytime the girls are out there. They’ve (community) always been a big support, and I’m glad that I’m apart of this community because it’s been strong with scouting,” Ranshaw said. If you have a sweet tooth and are craving cookies, the girl scouts will be at locations including Wal-Mart, Alpena, Alcona Area Credit Union, and Tractor Supply Store every weekend until march 19th.